Art With Mr. E: Are You Following Me?? Hey friends! 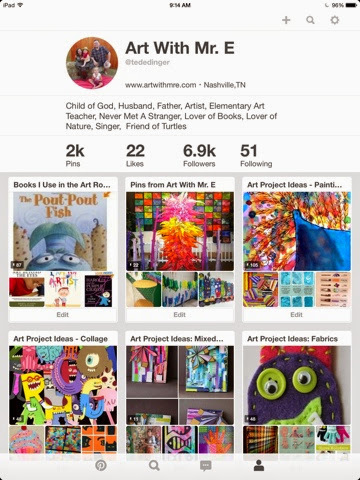 Do you follow me on Pinterest? I am 29 people away from having 7000 followers!! So if you aren't following me..pop on over!! My boards are almost all art eduction related ( though I do have a turtle board...and a superhero board!! Haha ). Come on over and check it out today! I popped into Pinterest and followed you. You can follow me @ http://www.pinterest.com/mrshenchy. Thanks, I really enjoy your blog!